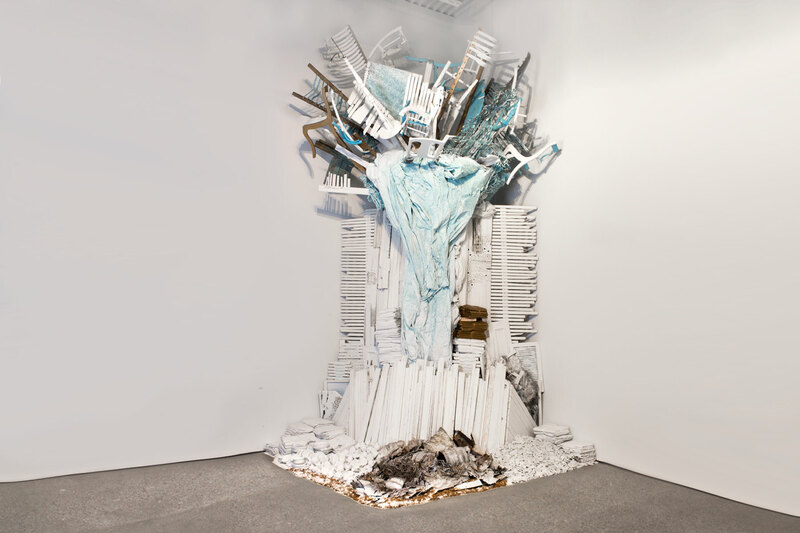 Julie Schenkelberg’s Lemurian Shift, a turbulent installation of broken furniture, found objects, housing rubble anointed with blue and white paint, is, in part, inspired by the Brooklyn-based artist’s Rust Belt hometown of Cleveland, Ohio. 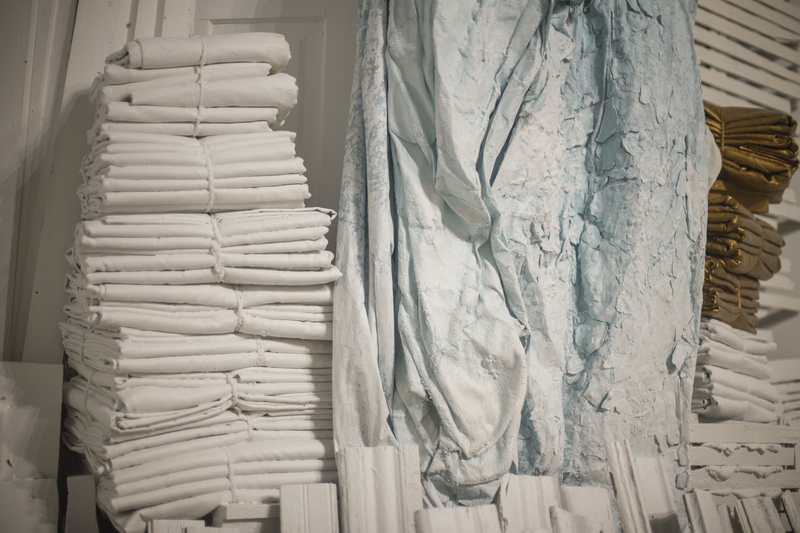 In the installation, paint is pushed through wood lath boards amidst a cascade of fabric weighted with paint, heaps of shattered dishware, the carcass-like remains and coils of a defunct mattress and bound and stacked parcels of an ambiguous nature. At the top of the installation the spout of shattered furniture is perched above the havoc. Still Lemurian Shift is not reliant on spectacle. It instead manages to navigate a subdued area of balance between form and fragility. The Rust Belt’s lost heyday of industry and prosperity may have inspired Schenkelberg’s domestic-themed collapse, but Lemurian Shift could reflect any place that’s fallen on hard times — a lack of specificity that adds up to a greater whole of something lost, found and rebuilt. 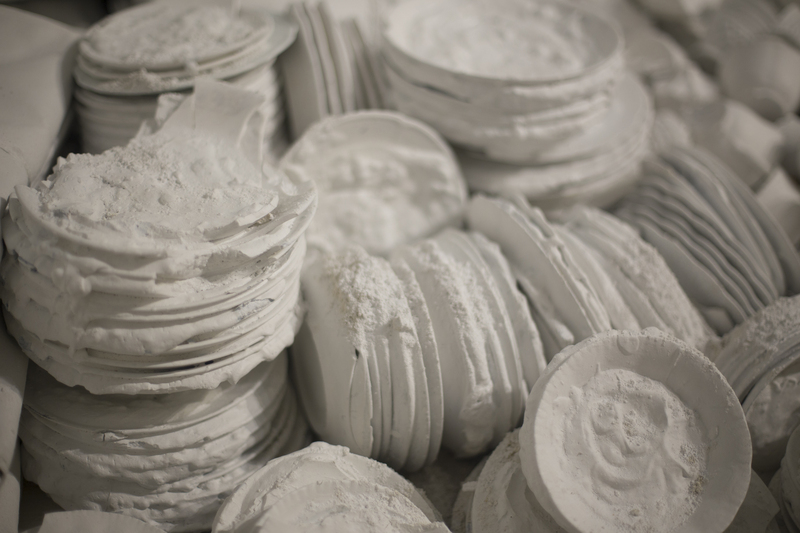 Schenkelberg has had exhibitions at Site Lab in Grand Rapids, Michigan, and the Mattress Factory in Pittsburgh.